Lisa K. Sabbahy. 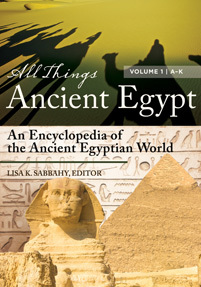 All Things Ancient Egypt: An Encyclopedia of the Ancient Egyptian World [2 volumes]. Greenwood, 2019. ABC-CLIO, publisher.abc-clio.com/9781440855139.